The wildflowers in the prairie areas are starting to bloom. The lore prairie area to the north of the overflow parking lot is filled with Winter Cress. 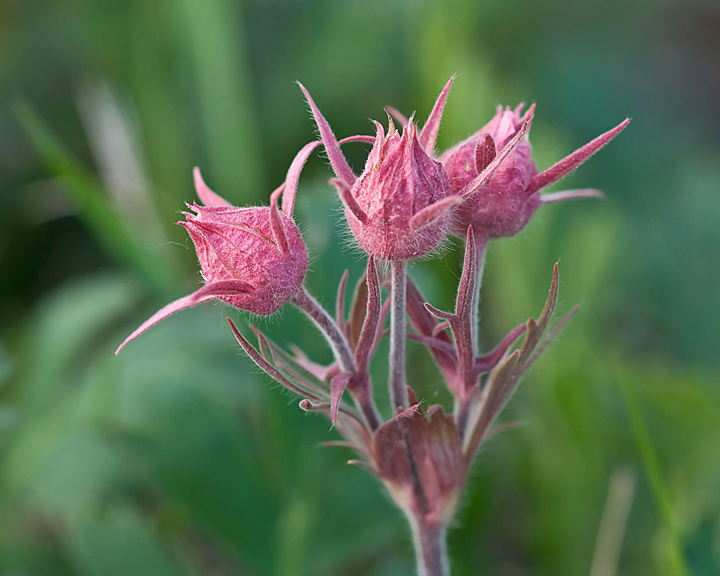 Along the prairie walk between the main and overflow parking lot the Pussytoes and the Prairie Smoke are blooming. This is my favorite time on the trail. 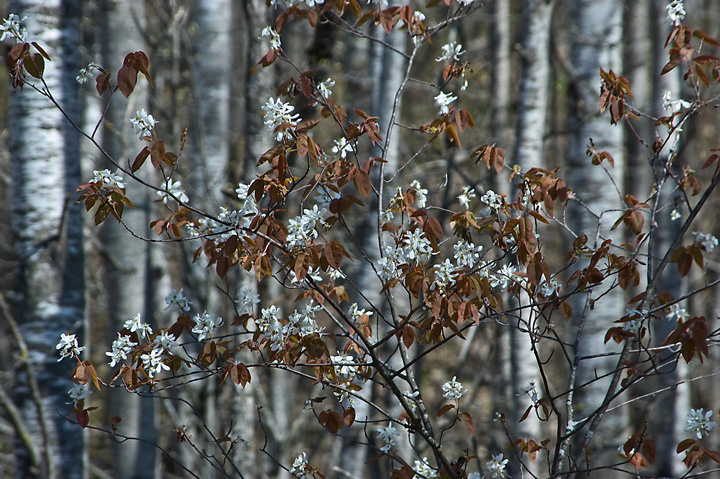 The brown of winter/spring is giving way to the green grass and flowers. The foliage on the trees is a wide array of reds and greens. 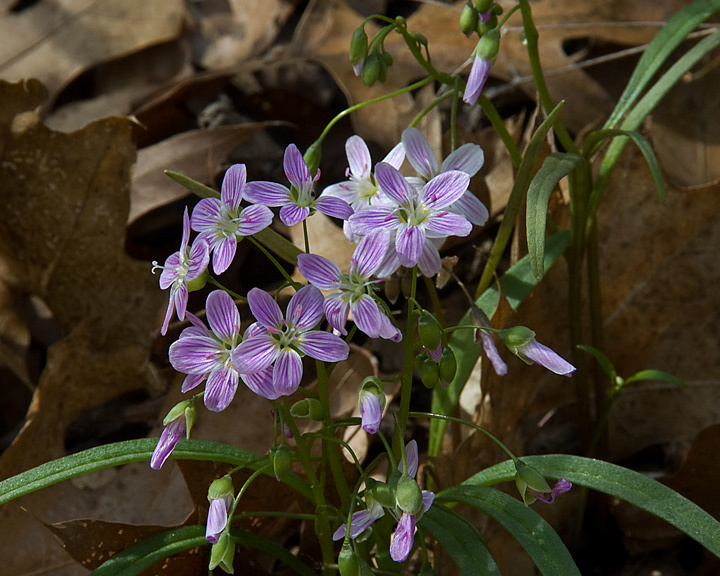 Some of the first wildflowers are just about gone now and the next group of wildflowers is appearing along the trail. The ferns are starting to unfold. The frogs are in full song as you travel along the trail. 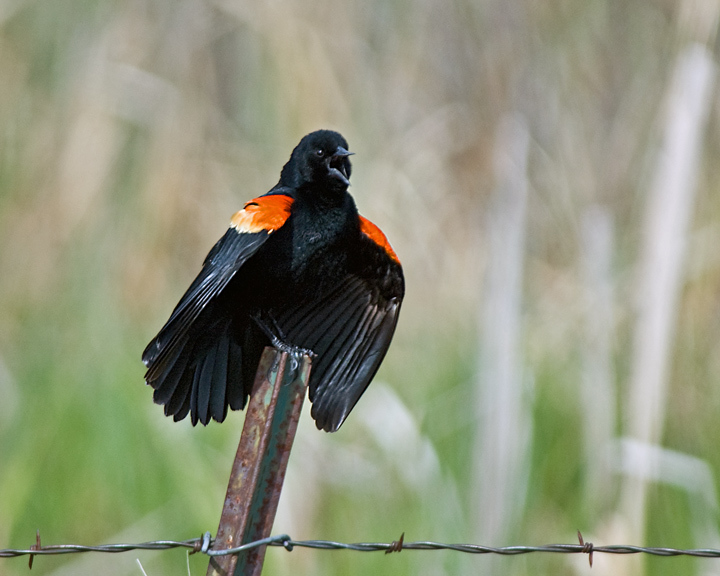 I had a chance to watch the Redwing Blackbirds courting along the wetlands. For the past 5 years I’ve participated in the Midwest Crane Count. I count in a small wetlands area near my home. For the last two years a pair of cranes has nested in a wetlands area that can be seen from the road. This year the nest is close enough to the road so that I can photograph the nest and can even see the eggs in the nest. On this particular day I visited the area around sunrise and had a chance to observe the pair changing places on the nest. Yesterday I took a series of shots showing the nest change. For some reason the bird taking over the nest had difficulty getting things just right so it took a number of tries before he/she settled on the nest. There are a few more shots on my website. My wife had a meeting in Rice Lake so I rode along and then went out to Murphy Flowage and hiked the Hemlock Creek Loop on the Ice Age Trail. The loop is only three miles long but it makes a nice short walk. There were a few Geese and ducks in the creek and one Osprey searching for food but not that may birds around. There were a variety of wildflowers blooming but it looks like next week might be better for flowers. Some flowers were out but more coming. The flowers should really start blooming if we receive rain this weekend. The Nice thing about the loop is there are benches along the way so allow you to sit and watch the wildlife. 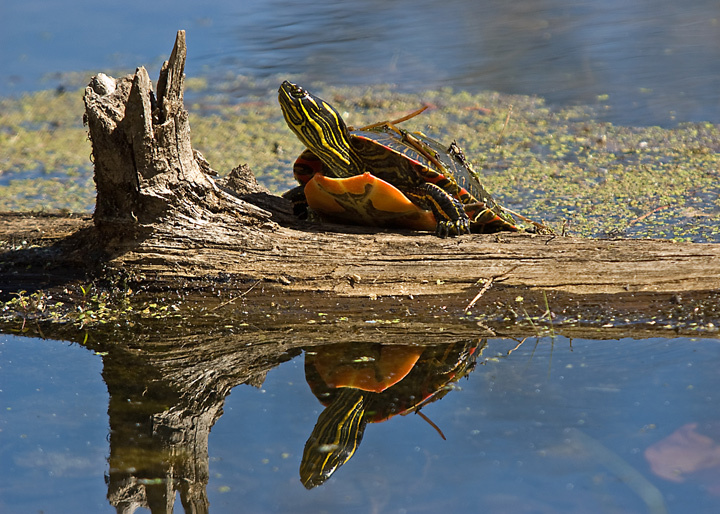 I sat for quite a while watching some painted turtles. There were also a variety of butterflies along the trail. 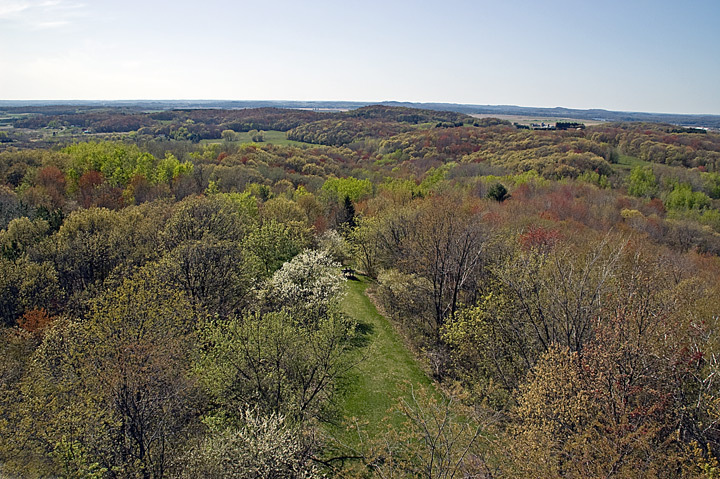 This week will see the peak of the foliage colors at Hoffman Hills. The many shades of reds, greens and yellows made for an outstanding spring color season. This week the cherries are in full bloom and the apple trees are starting to bloom. In my opinion the spring colors at Hoffman Hills are even more impressive than the fall color display. This is a shot from the tower looking west. The Geese are still on the nest on the first pond in the wetlands area. There is a pair of Mallard ducks setting up housekeeping on the second pond along with the many Painted Turtles. The birds are active with Bluebirds, Swallows, Redwing blackbirds, several species of Warblers and songbirds frequenting the prairie and the wetlands areas. There were a variety of butterflies out in both the wetlands and woods today. The wildflowers are starting to bloom throughout the area although it probably be next week before they really bloom in any numbers. More Hoffman Hills photos on my Website. Things haven’t changed a great deal on the Red Cedar State Trail this past week. The main change is in the large numbers of flowers along the trail. You no longer have to go looking for flowers they are everywhere. The good news is I have two large picture windows to view birds at my birdfeeder. The bad news is I have two large picture windows to view birds at my bird feeder. Unfortunately birds hit the windows on a fairly frequent basis in spite of my best efforts to prevent it. Most are able to fly away but some really slam into the windows. If I’m around I check to see if they are ok if it looks like they are in trouble I’ll go out and try and bring them around. 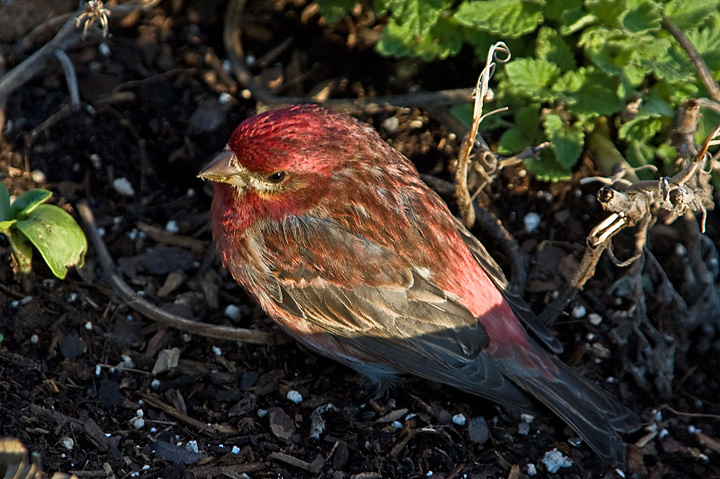 This Purple Finch hit the window last week. As I walked up it tried to stand but fell over. I picked it up and tried to interact with it. After about a half an hour it’s eyes seem to be brighter but it made not attempt to fly. I put it down in a planter and made sure the cat was inside. I checked on it periodically and kept interacting with it. When I approached after about two hours it flew to a bush that was a couple feed away and after another hour it few away. My previous record for helping a bird recover was two hours. More spring bird photos at my website. 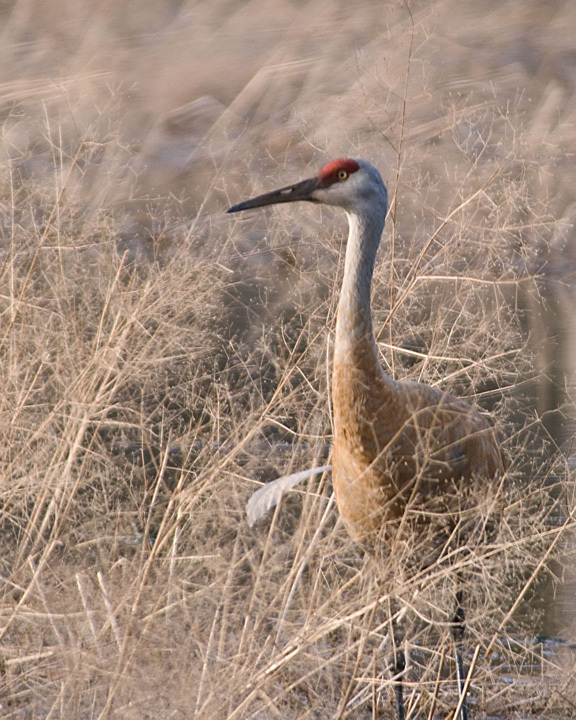 Every year since 1976 volunteers have counted cranes in the Midwest. The crane count has grown over the years and there are currently over 3,000 volunteers counting cranes in the Midwest. 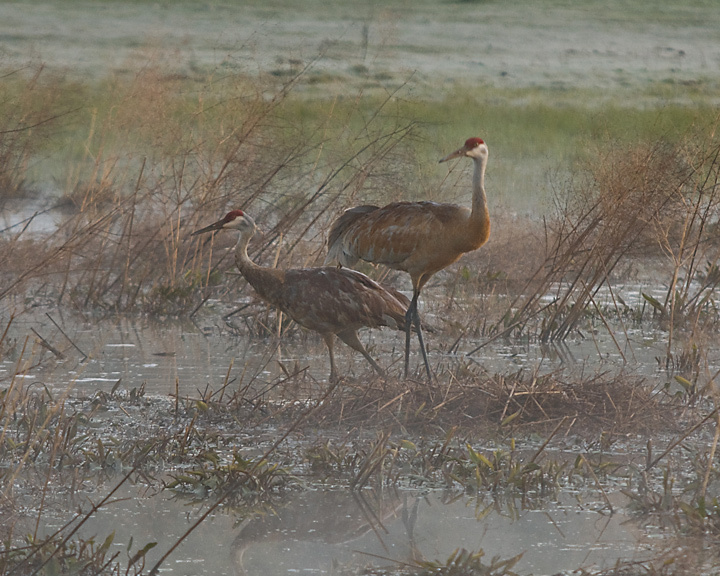 This year the crane count is on April, 17th from 5:30am to 7:30am. If this is something you would like to become involved in you should contact the International Crane Foundation. I have been counting at the Gilbert Creek Wildlife Area which is about 10 minutes from my home. Gilbert Creek is not a large area so there are not large numbers of Sandhill Cranes. The most I have counted over the years is 3 pair but typically I’m able to count only a single pair. In an earlier post I mentioned there is a nesting pair in the area. This year They were the only cranes I saw or heard. I was able to watch them change shifts around sunrise. As the relief crane walked up to the nest the crane on the nest got up and walked toward the relief crane. They called briefly then the relief crane tidied up the nest before taking its place on the nest. In the past I’ve been able to see or hear Pheasants and Turkeys during the counting period but this year I did not hear a single bird. More shots of the area on my website. I walked various sections of the trail this morning. Wildflowers abound in the area just north of the Chippewa River. 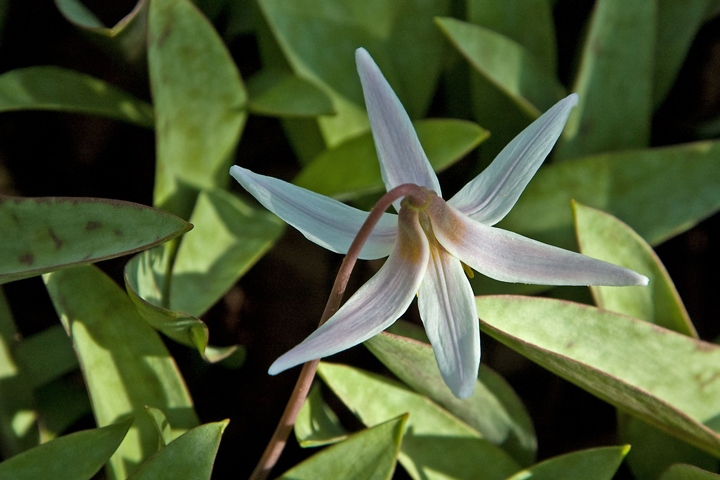 Spring Beauty, White Trout Lily and Anemone can be found in the woods along the trail. As mentioned in an earlier post the Bloodroot and Spring Beauty an Anemone can be found along the trail. I also noticed some March Marigolds, Swamp Buttercups and Violets on my morning walk. 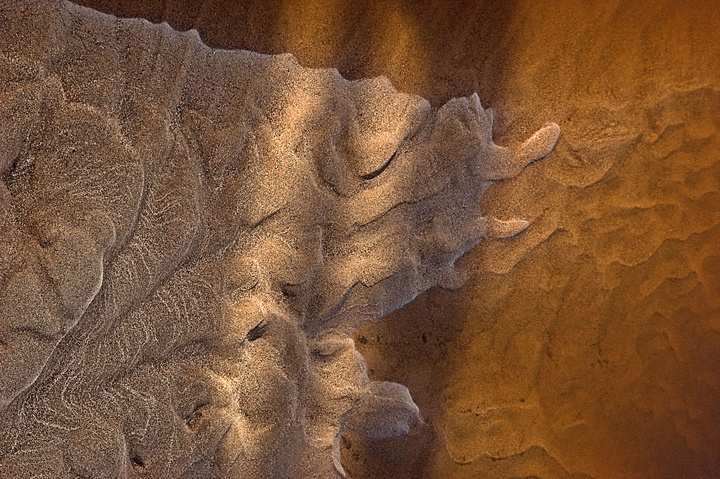 The bridge over the Chippewa River is where I like to photograph sand patters during the year. If you are there just as high water is receding you have a chance of capturing the patterns before they are destroyed by humans, birds and critters. The first of the spring warblers can also be seen along the trail. The Gilbert Creek Wildlife Area is located about 7 miles west of Menomonie, Wisconsin and is my favorite local area for photographing spring birds since it is only about 10 minutes from my farm. The spring birds started arriving several weeks ago. Canada Geese and several types of ducks frequent the area although there doesn’t seem to be as many birds as in past years. 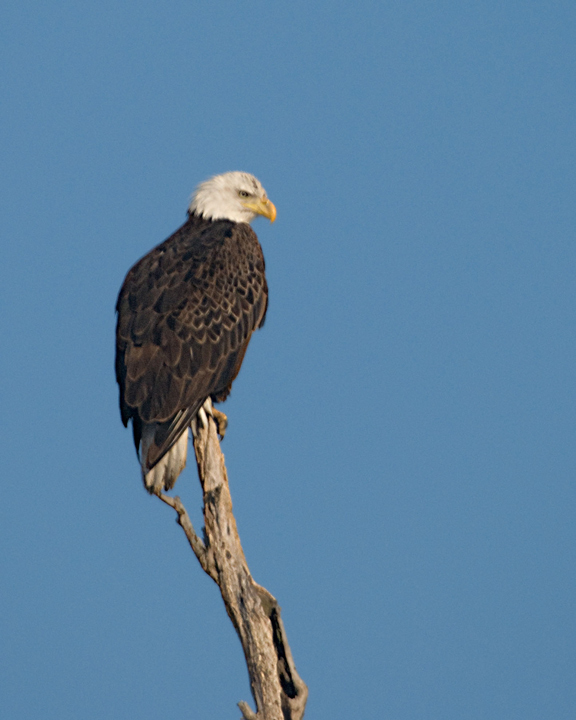 I’ve seen three mature Bald Eagles in the area recently. This year, for the first time, there is a Trumpeter Swan frequenting the area. Several weeks ago the Sandhill Cranes returned and I noticed a pair is now nesting fairly close to the road. More Gilbert Creek photos on my website.